World-first international research involving a Monash palaeontologist has provided new new insights into what caused the biotic crisis known as the ‘Mother of all Mass-Extinctions’ or the ‘Great Dying’, in which up to 96% of marine species and 70% of land vertebrate species became extinct. 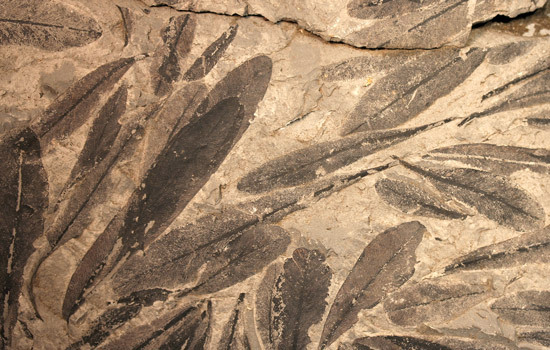 A matted layer of fossil Glossopteris leaves — a group of plants that dominated the vast coal-swamp forests of the Southern Hemisphere during the Permian period. This plant group was one of the main casualties of the end-Permian extinction event. Photo credit: Stephen McLoughlin. The study, led by the University of Nebraska-Lincoln and published today in Nature Communications is the first to establish directly the timing of the floral extinction relative to that of the marine extinction event and the Permian-Triassic boundary (251.9 Million years ago). “The research is significant because for the first time we have been able to show that land-based ecosystems underwent a major collapse long before the effects of the event were felt in the ocean,” said study author Dr Mays, a research affiliate at the Monash School of Earth, Atmosphere and Environment, and a postdoctoral researcher at the Swedish Museum of Natural History. “What this means is that life on land was particularly sensitive to the extreme surges of greenhouse gas and other climatic shifts of the past,” he said. The research team analysed the fossils, sedimentary rocks, geochemistry, radiometric age dates and modelled climate of the End-Permian mass extinction event from several rock outcrops and well-core stratigraphic sections in Sydney Basin, NSW. These multiple proxies were compiled into one cohesive timeline of events. “The fossil and rock evidence is mounting,” Dr Mays said. “Volcanically-driven greenhouse gases, and the related rapid temperature increase, is a primary driver of past mass extinctions. The results showed a total collapse of forest ecosystems hundreds of thousands of years before the onset of oceanic extinctions. Previous work has steadily built a picture of profound environmental changes across the Permian-Triassic boundary, but most research has been carried out on sedimentary rocks which formed in oceanic environments. ”The pattern of change on land, and particularly at high latitudes has, until now, remained ambiguous,” Dr Mays said. The oceans, initially buffered from the effects of changes on land would eventually have reached a tipping point as additional CO2 release led to rising temperatures in the seas, stagnation of oceanic circulation, and flushing of toxins and other products of environmental degradation into the world’s oceans. “This cascading extinction event, initiating on land and eventually killing off the majority of life in the oceans, makes a sorry tale,” said Professor Chris Fielding of the University of Nebraska-Lincoln.